For Haley Laue, the episodes would always begin in the same way. She would start to feel pain in the roof of her mouth and then her throat would begin to hurt. She knew what would happen next. Within two hours of developing those first symptoms, she would start to gag, vomit, and spit up phlegm in a fight to clear her lungs and get air into them. These episodes could last for two days, and as long as they would persist, she would be too frightened to lie down for fear of drowning in her own mucus. During the episodes, which started when she was in junior high school and came at the rate of about once a month, she wouldn’t eat, drink or sleep. In the end, she would become so dehydrated that her parents would need to take her to the emergency room where she would be given fluids intravenously. Her mother Teri Laue, a retired medical assistant and pharmacy clerk, tears up when recalling the trauma of seeing her daughter gasping for air. "She couldn’t breathe," said Teri. "It was the scariest thing." Haley, 22, is now a part-time college student living with her parents in El Dorado, California, about 30 miles east of Sacramento. At the age of 14, doctors diagnosed her as having myotonic dystrophy type 1 (DM1), but only after a difficult five-year odyssey that included a lack of understanding from school officials and physicians who didn’t seem to take her health problems seriously. In school, she had a history of learning disabilities, which teachers dismissed as attention deficit disorder (ADD), encouraging her parents to put her on medication. They refused. She would often get drowsy in class, and teachers would suggest she was not getting enough sleep. When she complained of chest pains in the school gym, they thought she was lazy and just wanted to sit out. Doctors weren’t much better. When Teri knew something more serious was going on than ADD, she told doctors that her mother had the hormone disorder Addison’s disease and suggested that Haley be tested for that disease. At first, doctors refused, and getting them to conduct testing was a fight. When Haley’s lung problems began to develop, her mother pushed doctors harder, eventually getting to the myotonic dystrophy diagnosis. Her father Jim was diagnosed shortly thereafter, although at the time he displayed only mild symptoms, primarily myotonia, or cramping in his hands. The problem Haley experienced with the episodes of choking on phlegm were caused by the progressing DM1. 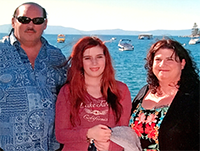 But a life-changing moment came for Haley and her family when they attended the 2012 MDF Annual Conference in San Francisco, which they learned about after a geneticist pointed them to the organization. "It was comforting to be there and have all these people around us who were there to help," said Teri, "and to learn about these different studies going on." The conference was eye-opening for Haley, who for the first time, had the opportunity to meet and speak with other people her age who also had DM1 during a youth group at the conference. "Haley loved it," said Teri. "There were a smaller group of kids that talked about their experiences and how DM affects their life. Wow! She liked talking to them. There were other kids out there that were going through things like she was and had the disease like she had." Haley is still in touch with other young adults she met at the conference. But the moment that proved transformational for her and her family came at the conference when they met representatives of Hill-Rom Respiratory Care who were displaying a device known as The Vest Airway Clearance System. The Vest, which looks a little like a purple life jacket, has two hoses that connect it to a small white box. Known as a high-frequency chest wall oscillation device, it is activated when a user squeezes a bulb connected to the device and causes it to begin vibrating intensely to loosen phlegm in the lungs. These devices are used by patients with various types of lung disease, such as Chronic Obstructive Pulmonary Disease, cystic fibrosis and bronchiectasis. "I couldn’t believe there was such a product out there," said Teri. But when she reached out to her daughter’s pulmonologist with excitement to tell her about the miracle device, Teri was livid to discover that not only was the doctor familiar with them, but they had been around for years. She could not understand why the doctor never suggested that Haley use one. The doctor tried to explain by pointing out that a price of $10,000 each, they were costly. As it turns out, the family’s health insurance policy included medical equipment coverage and paid for the device. Haley now uses The Vest twice a day for about thirty minutes each time. Prior to using The Vest, she takes a five-minute treatment of saline with a nebulizer, a device that turns the saltwater solution into a mist that she inhales to help loose mucus in her lungs. Today, Haley sleeps better, is happier, and no longer suffers from phlegm-vomiting episodes. Her father has begun to use The Vest as well, as his disease has progressed to his lungs. "If I had had to pay $10,000, I would have paid $10,000 for this," said Teri. "She has not had an episode throwing up at night since. It’s been years."